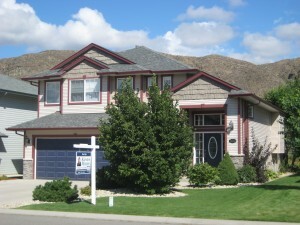 Beautiful 6 year old custom designed four level split home in Brock’s newest development West Briar Estates. There are four large bedrooms and three full bathrooms. The main great room area has high 16 foot vaulted ceilings and numerous windows. There is a beautiful mountain view from the kitchen, dining room, great room and patio. The large master ensuite has a large soaker tub, separate shower and large walk in closet. This home comes with all landscaping complete including in-ground sprinklers. There is also central A/C, central vacuum and a fully finished basement. The basement rec room has 14 foot ceilings and extra insulation for sound proofing. Other custom features include rounded corners, custom tile work, frosted glass pine doors, gas barbecue hook up on the patio, custom mouldings, most lights on dimmers or timers and gas fire place. This home has been entirely painted in the past 2 years. There is a two car garage and tons of storage under the stairs and under the outside patio. There is no HST on this nearly new home. Don’t miss out on this great home!